Detailed information and reviews of US agencies, music bands, magicians, clowns, djs, shops and suppliers offering wedding, children party and corporate event entertainment services. Post your requirements and receive no obligation price estimates and quotes. 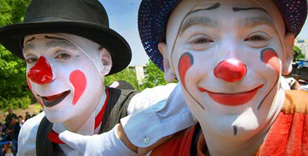 For 4 year old girls Birthday Party we would like to have a clown - The party is this Sunday July 10th we would like the entertainment to begin at 3:00. Child' B-day party - Magician for a 6 year old Birthday Party.